As it's Chocolate Week I made some super chocolatey Brooklyn Blackout cupcakes. 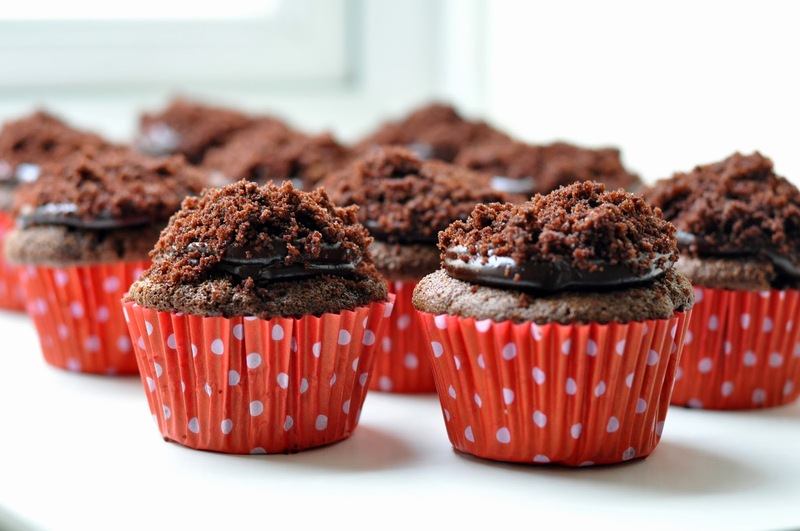 These cupcakes were made popular by Ebinger's Bakery in Brooklyn, New York. A rich chocolate cake filled with rich chocolate custard and frosted with the same rich custard and covered in cake crumbs. These cakes were named after the blackout drills in New York in World War II performed by the Civilian Defence Corps. All lights in the city were turned off and windows were covered with black material to practice so that ships sailing off to battle could not be spotted by enemy planes. Heat the oven to 170 degrees and line a muffin tray with cupcake cases. Slowly beat in the vanilla extract, cocoa powder, baking powder, bicarbonate of soda and salt until well mixed. 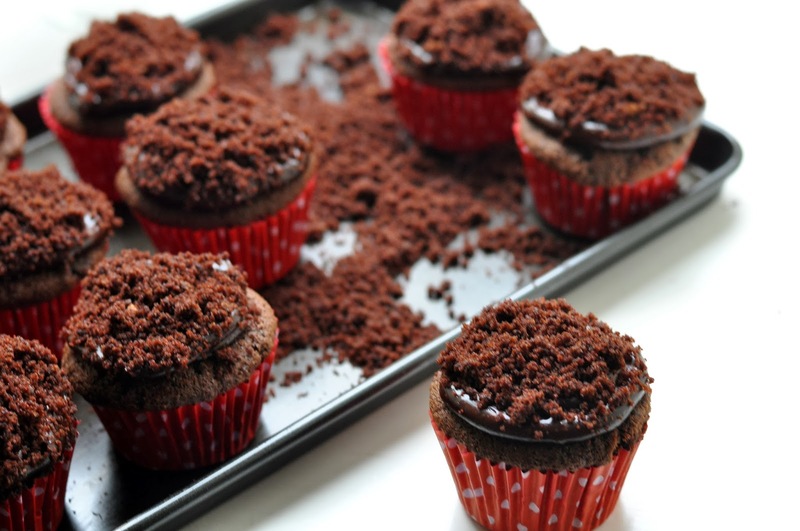 Divide the mixture between the cupcake cases and bake for 20 minutes. Leave the cupcakes to cool on a wire rack. For the chocolate custard, put the sugar, golden syrup, cocoa powder and 600ml of water into a large saucepan and bring to the boil over a medium heat, whisking occasionally. Mix the cornflour with 120ml of water, then whisk into the cocoa mixture in the saucepan. Bring back to the boil, whisking constantly. Cook until very thick, about 10 minutes. Remove from the heat and stir in the butter and vanilla extract. When the cupcakes are cold and custard cooled, use a pairing knife to cut out a cone shape from each. Put all 12 into a food processor and blitz to make fine crumbs. Fill each cupcake with a piping bag (I didn't use a nozzle for this) and then finish with a swirl on top. 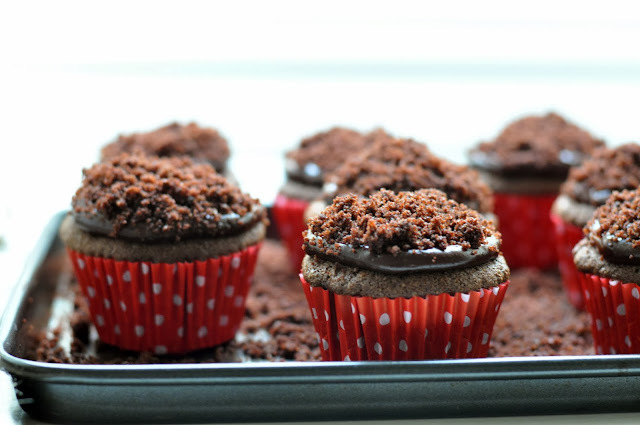 Sprinkle the cake crumbs over each cupcake to decorate. The amount of cornflour in the custard look like a lot. That is way too much cornflour. It is a lot but is the correct amount for the recipe - recipe from Hummingbird Bakery and that's what they say!